T Pyxidis, the supernova poised to destroy the earth at any time. OK, we can all stop worrying about the economy, the healthcare debacle, and the state of affairs in general; it looks like a supernova named T Pyxidis may be plotting our demise and ready to end all of our anguish. Doomsdayers and 2012 blog-keepers, take note. Astronomers at this week’s American Astronomical Society meeting revealed that a massive white dwarf star in the throes of multiple nova is much closer to our solar system than once thought. When it does finally collapse into a type Ia supernova — okay, if it collapses into a type Ia supernova — the resulting thermonuclear blast will destroy life on earth. Seriously. Oh yeah. This is an open thread. 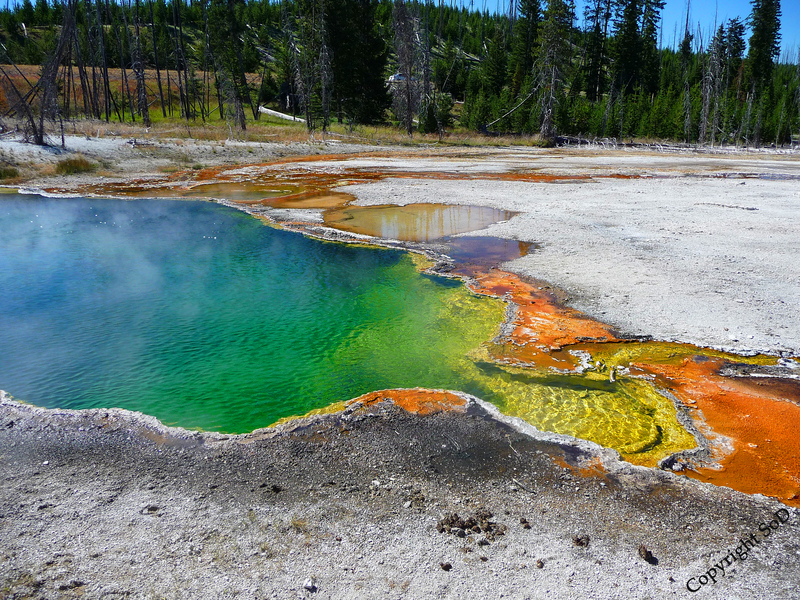 In the meantime, enjoy the beauty of a Yellowstone prismatic spring. I don’t just have a special interest in the next few years in Politics because of my status as a Budding Mystic. I actually happen to have a future to look forward to, dreams to strive for, ect. Let’s just thanks all the Gods I have decided to go into Healthcare for now. It’s a recession proof field, so I’ll be all right, even if my Writing career has to be put on hold for a bit. No doubt everyone here has heard of the coming Armageddon that is to supposedly befall us in 2012. We’ll get to that in a minute., but admittedly the news over the past few days has been rough. Torture Memos have been released, Iraq doesn’t appear to be doing all that well, Pakistan is trying to contain the Taliban in it’s own borders, the Swine Flu is spreading, Bea Arther has died (cries), ect. And let’s not not forget the Economy. Many people will tell you that the world is going to end in 2012 because that is when the Mayan calender ends. But that doesn’t really mean much. The Mayans vanished off the face of the Earth, if I remember correctly (and you will have to forgive me if my memory on this subject doesn’t serve me all that well, as I am too lazy to look it up). The Mayan calender has thirteen cycles, and 2012 is, I believe, the end of the last cycle. So does that mean the world is going to self destruct? Hardly. You have likely heard of a series called Left Behind, by Jerry B. Jenkins. It is all about the “Rapture” and the “Tribulation” and the “End of the World.” It is possibly one of the silliest series on the planet, because, for one thing, it is based off of the Book of Revelations. Have you read Revelations? I laugh at anyone who claims they can actually interpret that book of the Bible. Left Behind was made into a movie that failed in the box office, but the nonetheless it sparked some of the “End of the World” feelings in the General Populace. For one thing, I don’t take the book of Revelations seriously. I remember one incident in particular that solidified that feeling. My mom gave me twenty bucks to go to Youth Group with some old family friends when I was sixteen or so, and they were talking about Revelations. I was bored, and I took an interest in the conversation. That was around the time The Da Vinci Code was causing quite a controversy, and I had been reading Elaine Pagels, so I asked the Youth Pastor who wrote the Book of Revelations. This is how our exchange went. (Again, forgive me if some facts are wrong here. It has been at least a year since I last did any heavy lifting on this topic and as I explained, I am too lazy to look it up). Me: So no one actually knows who wrote it? It says here that this John had a dream and this is what the entire book is about. A dream. Me: And I am pretty sure that the Book of Revelations was written quite some time after Jesus’s death, right? Like…. hundreds of years or something? So how can this book have been written by John the Disciple? That makes no sense. So it must have been some other John. This entire book, the Book of Revelations, is just a dream by a random guy named John! Me: That’s it, isn’t it? Me: Okay, then. I’ve proved my point. Carry on. I didn’t bother arguing any further because the guy sitting next to me was really hot, and I got distracted. But I’m still not going to forget that conversation because it just made me think more about 2012. Personally, I don’t think that in 2012, the world as we know it is going to end just because the Mayan Calender will. A lot of people actually believe that the next few years will be filled with upheaval (Wars, Famine, and Economic Collapse) and the result will be a spiritual awakening, or something of the like, in 2012 that will mark the beginning of a long process that will take us to the Age of Aquarius. I don’t know, myself. But I know I’m going to try to remain optimistic, no matter what happens. I won’t get upset about what’s in the news. What will happen will happen. As little people, we might not think we have control over much, but… okay, we don’t have control over much. Shadows always pass, but then the Sun comes out. Sometimes, for things to drastically change (and don’t you agree that things need to drastically change?) we have to endure pain and sadness. It’s like making mistakes. You can’t regret them TOO much, or else you’ll never learn from them! Well, anyway, I just needed to share that with someone. “End of the World” Open Thread!